Sissu village is situated on the bank of river Chandra. 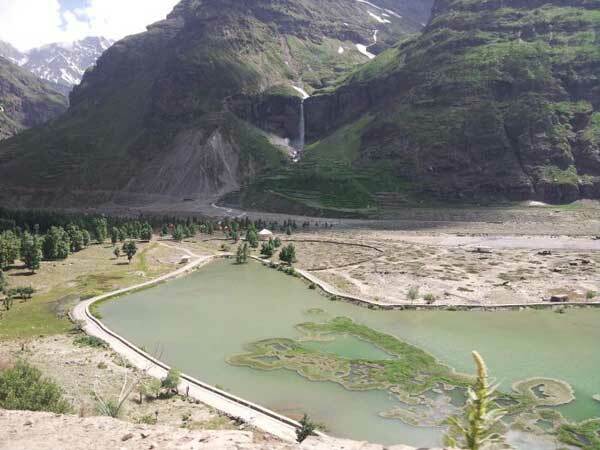 Sissu village is located 90 km from Manali. It lies between 32°29′0″N and 77°7′0″E. The altitude of Sissu Village is 3210 m form sea level. The village also known as Khagling is on the banks of River Chandra. This is a fantastic little village and is surrounded by mountains. The Gyephang peak is visible from this village. The dense trees of willow and poplars on the both sides of the road. The trees are very dense that even sun rays fail to penetrate. The terraces are green with potato, peas, barley and buck wheat. The view of waterfall across the river is beautiful. There is a swampy patch on the river side where the siberian wild duck and geese halt when on their way back from the Indian plains. The snow trout is also available in the village near the river side. Behind the Sissu village the famous Gyephang peak. The lord Gyephang is the deity of Lahaul. In the olden days people of Lahaul fought their wars under the banner of Lord Gyephang. The temple of Lord Ghepan is in the village. The templee of Lord Gyephang is not open to outsiders. By Air: The nearest airport is Bhunter which is 175 km away. By Tarin: There is no railway network. The nearest railway station is Shimla. By Bus: By road the distance is 115 km from Manali, 188 km from Kaza, 373 km from Leh, 435 km from Chandigarh and 690 km from Delhi. Due to heavy snows fall the region is cut off for six month November to June. Taxies are available from Manali in season. Lahaul remains cut-off from outside the world till mid June due to heavy snowfall and closing of Rohtang Pass. The winter are very cold heavy woolens clothes are recommended. In summer the day is hot and nights are very cold. Wooleans clothes are recommended.